A colleague sent me this link for The Splendid Table, where they featured a story from The Perennial Plate, which follows Daniel Klein and Mirra Fine as they travel the world to explore how people eat and how their food is made. 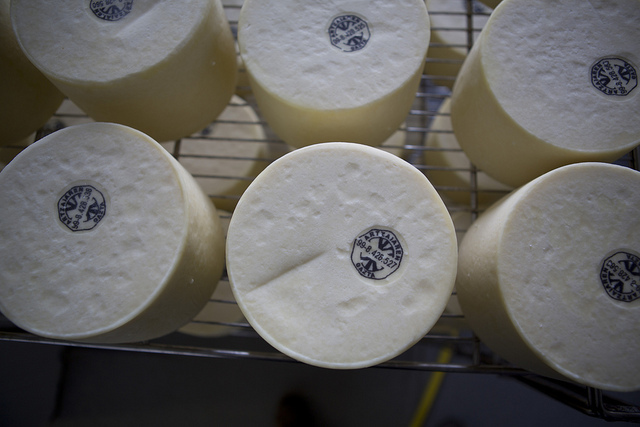 The most recent episode took them to Spain, where they made a stop in the Basque Country to delve into the world of Basque cheese, specifically Idiazabal (which, incidentally, is not all that far from where my mom’s grandfather grew up in Mutiloa). They encounter a sheepherder and partake of some wonderful cheese. The video has some great shots of food in the Basque Country, from a sagardotegi to pintxos to the cheese. There is also an accompanying blog post by Mirra Fine that describes her experience as a vegetarian at the restaurant Etxebarri — to sum it up, she found what must be one of the few vegetarian oases in the Basque Country (you can just ask my wife, my brother, and his wife, who had a very difficult time eating in the Basque Country — how many times can you eat mushrooms?). This all brought to mind two anecdotes involving Basque cheese… The first involved my first-ever trip to the Basque Country, when I was about 20. I lived in Donostia for a year and would visit my dad’s family on the weekends. His aunt lives in the mountains above Munitibar, where she and her family still lived in an old caserio and had their own band of sheep. As I was preparing to leave, after a year of learning Euskara (not well) and learning about the Basque Country (hopefully better), to return to the United States, she insisted that I take two wheels of cheese back home. This was in 1991, when it was still very difficult (maybe nearly impossible) to get foods directly from Spain, and this cheese was certainly not pasteurized. I was pretty naive about the ways of Customs and this was also before the days of the TSA, so I dutifully wrapped the cheeses in plastic grocery bags, stuffed them in my suitcase, and away I went. I never mentioned them on the customs form (not even sure if I checked that I’d been on a farm). Through the gates at Customs I went without nary a glance and dutifully delivered the cheeses to my dad. I think the only consequence of my small act of smuggling (does this count as smuggling?) was that my suitcase and the clothes in it smelled pretty badly. Previous PostA few links to shareNext PostiLike Bilbao… do you?